Hiya guys. How's it going today? It's been a long weekend and I have been feeling under the weather again due to my hydrocephalus. But nothing can keep this girl down for long, especially when there are polishes to swatch. Today I have more polishes from Savvy Naturalista to share with you guys that have recently been released. As I mentioned in my post last week, Savvy Naturalista is an all-natural handmade bath and beauty boutique. 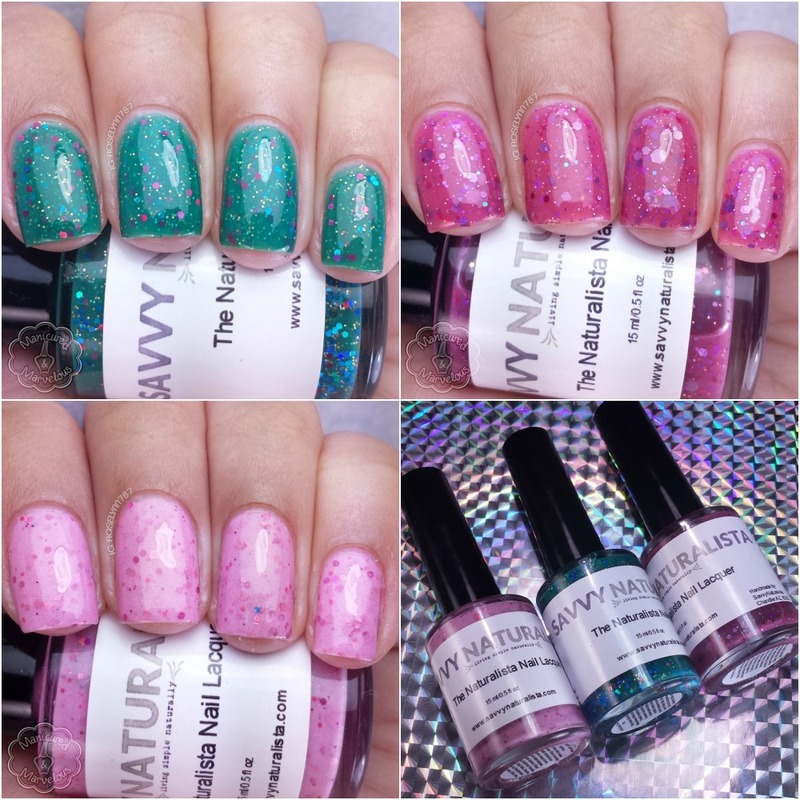 The three polishes shown here from Savvy Naturalista are now available for purchase. Each polish can be purchased in full-size bottles individually for $7.00. Smash That Tutti Pink can be described as a cotton candy pink crelly filled with darker pink hex glitters. 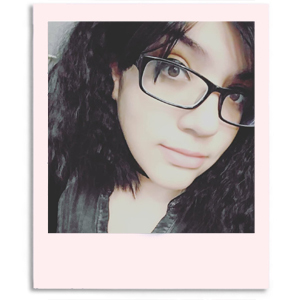 It's such a delicate tone and not a shade I expected to look so well on me. The formula was a little bit thick, but definitely manageable. This is a very glitter heavy polish - hence the bit of thickness - and there will be no need to fish for glitters. Because of this the finish always dries a bit on the textured side, so add a nice thick layer of topcoat to smooth down the finish. Shown here in two coats and sealed with double layers of Seche Vite topcoat. 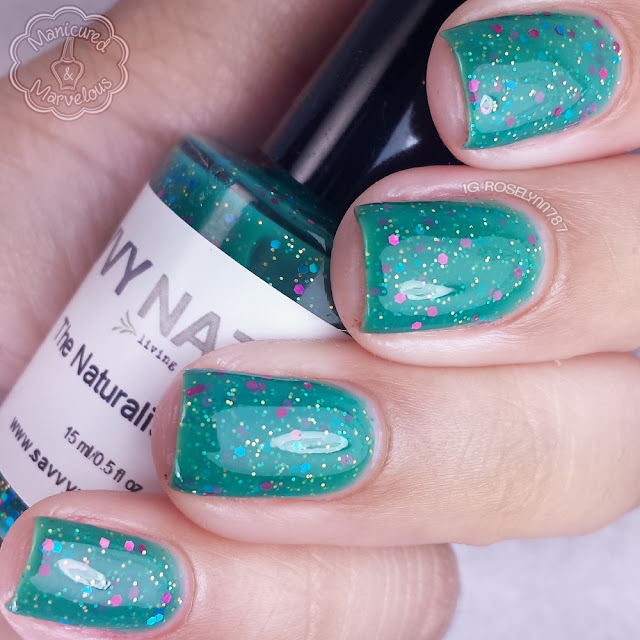 Let The Green Thumbs Roll is a green crelly polish with bright pink and blue hex glitters. Definitely my favorite of the three I'm showing here today! It's such a unique and beautiful color to glitter combination. Doesn't it just remind you of a garden? Simply love it and it's my pick for must-have. The formula tends to apply more like a jelly rather than a crelly polish in my experience. But it does have a smooth consistency and applies with ease. Shown here in three coats and sealed with Seche Vite topcoat. Pimp My Fuchsia can be described as a dark pink filled with small and medium hex glitters in pink, purple, and blue. Very summer friendly shade and glitter combination. I do feel like I have worn and seen similar tones so it doesn't blow me away as much as the previous polish swatch did. Still if you don't have anything similar in your collection, then you should definitely check this one out. Fun color and I love it against my skin-tone. The formula here again leans more towards jelly than crelly, but it's a great consistency. Shown here in three coats and sealed with Seche Vite topcoat. 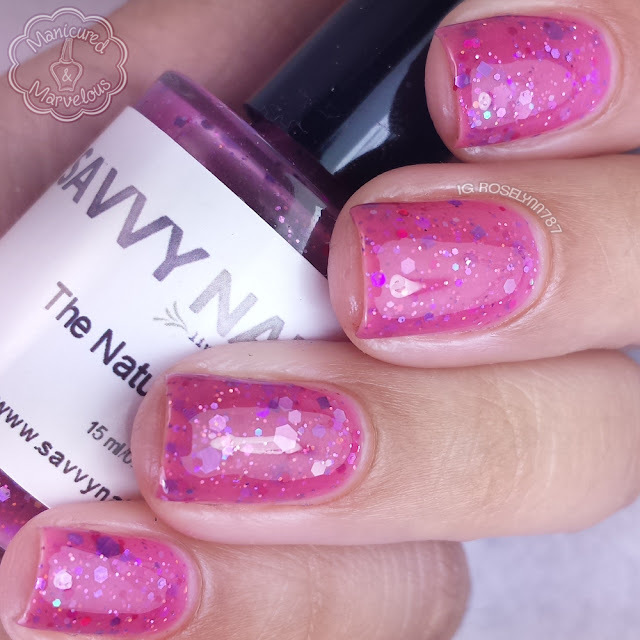 Overall I find myself feeling very satisfied with the polishes from Savvy Naturalista. Let The Green Thumbs Roll is definitely my favorite from the bunch. The formulas for the two do lean more towards jelly than crelly polishes in my experience so that is something to keep in mind. It just makes them look that much more squishy and luscious to me! What do you guys think? Which one is your favorite shade? your swatches are always so lovely. So pretty!!! Especially Let The Green Thumbs Roll, it's squishy and pretty and perfect! Great swatches! Smash That Tutti Pink is gorgeous. Beautiful swatches as always! Love Let the Green Thumbs Roll! Always love your swatches! I love Smash that Tutti Pink, I always love pink polish! I LOVE the glitter mix in Let The Green Thumbs Roll! Great pics and great post! Oh your swatches are totally drool worthy! I need Let the Green Thumb Roll! Let The Green Thumbs Roll is so pretty! Sorry you haven't been feeling well! Gorgeous pics, nevertheless! I really like the green one with that pop of pink glitters! Love the light pink one :) Beautiful swatches! I really like Pimp My Fuchsia. Great swatches! What a lovely squishy shades! They look great on you. Jellies and crellies are my weakness! This is a lovely group of polishes and your swatches are amazing as always. These are beautiful! Love Pimp My Fuchsia! Oh my word Let the Green Thumbs Roll is gorgeous! Oooooh- I like "Let the Green Thumbs Roll!" Such a pretty glitter combo. I LOVE all 3!! Shundara continues to amaze me with her creations!! Great swatches!! !